For most people, spending a decade as a reliable major leaguer with a .290 career batting average would stand as the achievement of a lifetime. But the argument could be made that Frank Baumholtz’s baseball accomplishments ranked third behind a standout basketball career and an impressive record of service in World War II. However you stack them up, the pioneering two-sport star compiled quite a résumé, especially for someone who didn’t even crack the big leagues until he was 28. The family lived in company housing when Frank was young. They had no electricity and used lamps to light each room. The lamps could be mounted in rings on the walls – rings that, when empty, prompted young Frank to take up basketball in its most primitive form with help from a small rubber ball. Eventually he procured an old sweet-potato basket from a grocery store, knocked out the bottom, and nailed it to a post near his house. Dr. Naismith would have been proud. With endless practice, Frank quickly became a standout among the neighborhood kids – and not just in basketball. By the time he reached Midvale High School, he also ran the mile and half-mile, threw the shot, and pole-vaulted for the track team, in addition to pitching and playing first base and the outfield for the baseball team.3 He earned 12 varsity letters. Midvale was good enough to play deep into the Ohio state basketball tournament, making it all the way to Columbus, and Frank’s performance caught the eye of college coaches around the region. He ultimately decided he’d rather stay close to home and signed on with Ohio University. Freshmen weren’t eligible to play on varsity squads in those days, so Baumholtz spent the 1937-38 season on the freshman team coached by Dutch Trautwein. They all moved up together the following season, with Trautwein taking over as varsity coach, and went 12-8 in 1938-39, then improved to 19-6 the next season. With his personal life squared away, Baumholtz continued his rise to stardom, and had an unforgettable senior season. The 5-foot-10, left-handed guard led Ohio U. to a 16-3 regular-season mark that earned the Bobcats a spot in the pre-eminent postseason affair of the day, the National Invitation Tournament at Madison Square Garden. Baumholtz left New York sportswriters enraptured with his small-town tale. Cohane proved prescient. Baumholtz scored 12 in a 45-43 semifinal win over City College of New York and 19 in a 56-42 loss to coach Clair Bee’s Long Island University Blackbirds in the final, and he was named MVP despite his team’s runner-up status. The trio headed to Riverside in the Class C California League, where Baumholtz hit .278 in his first 19 games as a pro before the Riverside franchise folded on June 29. Baumholtz was shipped to Ogden in the Pioneer League to finish out the season, hitting .283 in 74 games there. Nothing spectacular, but not a bad start for a guy known more as a basketball player. Here a slight detour was in order. The Selective Training and Service Act of 1940 instituted the first peacetime draft in US history. Baumholtz thought he might enlist in the Army or Navy and get his one-year hitch out of the way instead of waiting to be drafted. Like other notable athletes in similar positions, he had been receiving letters from the Great Lakes Naval Training Station, outside Chicago, urging him to join the Navy there while contributing to the burgeoning Great Lakes sports program. On October 8, 1941, Baumholtz enlisted in the Navy. He couldn’t have imagined at the time that he wouldn’t be back in Organized Baseball until 1946. Two months later the US was at war. Baumholtz was in line to make the roster11 for a July 7 benefit game between an Army-Navy all-star team and the American League All-Stars at Cleveland Municipal Stadium. But on July 2 he was commissioned an ensign and received orders to report to the Armed Guard School12 at Naval Station Treasure Island in San Francisco. This was where Baumholtz’s path diverged from that of many of the ballplayers who joined the armed forces in World War II. Many of the more established players spent their time in physical-education programs and staging exhibitions to boost the morale of other troops. But the combination of Baumholtz not yet being established as a major-league player and the fact that he had a college degree, which helped him gain his commission, put him on track for the kind of combat duty that many Great Lakes players never had to face. The Armed Guard was responsible for protecting merchant ships from attack by enemy planes, ships and submarines. Armed Guard officers led Navy gunnery teams of about two dozen that worked in concert with the civilian seamen they were assigned to protect – “a kind of doctor, chaplain and commanding officer at the same time,” as a Navy history put it.13 Aside from a short break that allowed him time to rush home to Cleveland and marry Bettie Bell, Baumholtz spent much of the period from late 1942 through the spring of 1944 on ships making convoy runs across the Atlantic. By the summer of 1944, Baumholtz was a lieutenant commanding a new Landing Craft Infantry (Large) vessel. LCI(L)-633, launched a week after the June 6 D-Day landings in Normandy.14 On June 25 LCI(L)-633 embarked from Pier 42 in New York en route to the Pacific. Baumholtz and his ship – later converted to mortar duty and redesignated LCI(M)-633 – saw action in the final two major battles in the Pacific, providing fire support off Iwo Jima in February 1945 and Okinawa two months later. The 633 took a hit from a Japanese mortar at Iwo Jima but did not suffer major casualties. The crew witnessed more than enough of the war’s horrors close at hand. Baumholtz recalled being about 1,500 yards from the USS Birmingham when a kamikaze hit the cruiser, essentially knocking it out of commission through the end of the war. In late August, with the war over, Baumholtz was given command of LCI Group 61.15 He had the opportunity to take a flotilla of ships back to Japan to serve with the occupying force, but he also had enough “points” accumulated to be discharged from the Navy. With very little contemplation, he chose to muster out and was back home in Ohio around the end of the year. But his war didn’t end for some time. It did not take long for Baumholtz to resume his athletic career. Days after returning home following his discharge, he got a call from the general manager of the Youngstown Bears of the National Basketball League, a forerunner to the NBA consisting mostly of teams in Midwestern cities. Baumholtz quickly settled into the Bears’ lineup and ended up averaging 10.5 points in 26 games, good enough to be named second-team all-NBL. But he didn’t finish the season with Youngstown. Baumholtz, 27, was the oldest player on the team, but he didn’t show much rust from his years away from the game. He hit .343 in 119 games for Columbia, second only to 21-year-old Ted Kluszewski (.352) among the regulars, and racked up 43 doubles and 13 triples along the way. That showing was sufficient to put him on the radar of the Reds brass heading into the winter – which, once again, Baumholtz spent on the court. The Cleveland Rebels were an original member of the Basketball Association of America, which began play in the fall of 1946, and Baumholtz was a natural fit as one of six Ohio natives on the roster.18 He starred from the outset, scoring a game-high 25 points in the Rebels’ season-opening win against the Toronto Huskies.19 Baumholtz played 45 games for the Rebels that winter – making $4,000 for his trouble20 -- and once again was named second-team all-league. His 14.0 points per game ranked as the eighth-best average in the BAA. Baumholtz saw 1947 as a do-or-die year for his major-league aspirations. His basketball credentials were well-established, but he wasn’t keen on the prospect of continuing to bail on his teams before the end of the season to report to spring training, only to be stuck in the minors – essentially messing up both sports, as he put it. Sure enough, that was the year Baumholtz finally established himself. Leading off for the Reds on Opening Day against the defending World Series champion St. Louis Cardinals, Baumholtz went 2-for-4 with a double and an RBI in his major-league debut. He went on to lead the National League with 711 plate appearances and ranked in the NL’s top five in hits (182), doubles (32), and triples (9) on his way to finishing a distant fifth behind Jackie Robinson in Rookie of the Year voting. It’s fair to say the Reds might have had another theory about the drop-off in Baumholtz’s performance: fatigue. Shortly before the season ended, Warren Giles called Baumholtz into his office. In his hands, upside down, was a check. The Reds wanted Baumholtz to stop playing basketball in the offseason, and they were prepared to pay him to agree. Easing his offseason load didn’t help Baumholtz get out of the gate strong in 1948. He started the team’s first 21 games, but his average was down to .212 on May 9. Two days later the Reds acquired veteran outfielder Danny Litwhiler from the Boston Braves and made him their starter in right field. Banished to the bench, Baumholtz now saw most of his action as a pinch-hitter or defensive replacement. He started to show signs of life at the plate in a few starts in June and regained his starting spot in early July. Riding a 12-game hitting streak, he was hit on the right elbow by a Larry Jansen pitch leading off the July 19 game against the New York Giants. X-rays were negative,25 but it was six days before Baumholtz was back in the starting lineup. Those types of little, nagging injuries – some from being hit by a pitch, some from crashing into outfield walls – would pop up with some regularity throughout Baumholtz’s career. He wouldn’t approach the playing time he got as a 28-year-old rookie in 1947 for the rest of his big-league career. In early August, on their way to a seventh-place finish on the heels of a fifth-place showing the year before, the Reds fired Johnny Neun and named Bucky Walters manager for the balance of the season. Walters re-signed for the 1949 campaign, but wouldn’t find much use for Baumholtz. One of the few bright spots for the Reds in 1948 was the play of Hank Sauer, who pounded out 35 home runs in his first full season in the majors. Through the first six weeks of the 1949 season, though, both Sauer and Baumholtz were struggling at the plate. Bauer was hitting .237 with just four homers in 42 games, while Baumholtz was at .235. On June 15, the day of baseball’s trade deadline, the pair were dealt to the Chicago Cubs for Peanuts Lowrey and Harry “The Hat” Walker. The change of scenery didn’t do much for Baumholtz. Two days before the trade, Frankie Frisch had replaced Charlie Grimm as manager of the Cubs. Frisch started Baumholtz only sporadically and the outfielder slumped to a .229 average to close the season, the worst year-end number of his career by more than 40 points. Decades later, Baumholtz repeatedly used the word “devastated” to describe his initial reaction to the trade and its aftermath,26 but the biggest shock was yet to come. Hoping for a fresh start in 1950 as the Cubs went through spring training on Catalina Island, Baumholtz was stunned when Frisch told him he wouldn’t be making the trip back east with the Cubs. Instead, he would spend the entire year with Los Angeles of the Pacific Coast League – a demotion that ultimately got his career back on track. 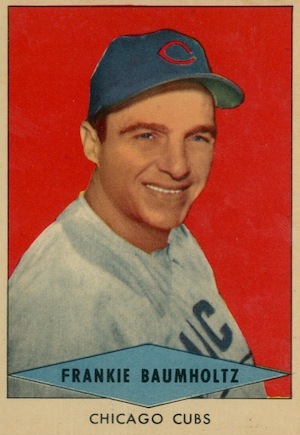 Eighty games into the 1951 season, the Cubs fired Frisch and installed Phil Cavarretta as player-manager. Baumholtz later called Cavarretta the best manager he ever played for,30 and by this point it was clear he was back in his comfort zone. At the plate he was back around .300, and his offensive numbers at the end of the season were nearly identical to those from his rookie campaign four years earlier. His major-league bona fides re-established, Baumholtz went on to have the best offensive season of his career in 1952, contending for a batting title into the final weeks of the season – but not without more trouble from the injury bug. Baumholtz injured ligaments in his right shoulder attempting to make a shoestring catch at the Polo Grounds on May 17, and was sidelined for two weeks.31 Five days after returning to the lineup, he was hit in the right hand by a Warren Spahn pitch, breaking a metacarpal32 and sidelining him for six more weeks. Baumholtz returned to the lineup shortly after Spahn escaped that trip to Chicago unscathed, and after a brief lull at the plate he was back above .300 again by mid-August. A month later, the unthinkable: Baumholtz found himself within striking distance of Stan Musial, who had been cruising toward his third consecutive batting title. The Cubs’ final six games of the season were against the rival Cardinals, though with an unwieldy five-day gap between the series at Wrigley and the season-ending set at Sportsman’s Park. (The Cardinals hosted the Reds for three during that span.) On September 20, after the middle game of the series in Chicago, Baumholtz stood at .332 and Musial’s average had dipped to .333. But that was as close as Baumholtz got; he went 2-for-14 in the Cubs’ final four games to finish at .325, while Musial went 11-for-26 in seven games to hit the wire at .336. Baumholtz had one big offensive season left, hitting .306 and racking up 36 doubles in 1953. That was the first of consecutive seasons that saw Baumholtz, at age 34 and 35, serve as what passed for the wheels in the Cubs outfield. He spent more time in center field than he had in recent years, and was flanked by Sauer and Ralph Kiner, neither of whom was getting paid for his work with the leather. Chicago’s defensive alignment became a favorite talking point of sportswriters of the time and the legend of poor Frankie in perpetual motion around the Wrigley Field grass would persist for decades. In the end, Baumholtz could be secure in his status as a good player in what has often been called the golden age of the sport, with the likes of Musial, Ted Williams, and Joe DiMaggio among his contemporaries. Frank and Bettie had a son and two daughters, all of whom followed in their parents’ footsteps by graduating from Ohio U.
Bettie died of cancer on April 27, 1980, in Cleveland. Frank continued to live in Cleveland through the 1990s before moving to Florida to be near his daughters. Frank Baumholtz died of complications from colon and liver cancer on December 14, 1997, at a nursing home in Winter Springs, Florida.43 He was 79. 1 The 1940 US Census lists both of Baumholtz’s parents as being born in Yugoslavia, which did not become a country until after World War I. Frank Sr.’s World War II draft registration card from 1942 lists his birthplace as Austria, indicating the family likely came from a German-speaking area of what is now Slovenia but was part of the Austro-Hungarian Empire at the time of his birth. 2 Frank C. Baumholtz, interview by William J. Marshall. December 10, 1992, Baseball Commissioner Oral History Project, Louie B. Nunn Center for Oral History, University of Kentucky Libraries. (Hereafter cited as Baumholtz interview). 6 Tim Cohane, “Ohio U. Defeat of Duquesne Scrambles Court Ratings,” New York World-Telegram, March 19, 1941. 8 “Reds sign 2 Cleveland Boys Playing at Ohio U.,” Associated Press via Cleveland Plain Dealer, June 2, 1941. 10 “Sailors Defeat Indiana Nine in First Game, 13-4,” Chicago Daily Tribune, April 29, 1942. 11 “Two Great Lakes Stars Find Navy a Door to Big Leagues,” Associated Press via the Washington Post, July 4, 1942. 12 Ninth Naval District World War II War Diaries, 1941-1945, accessed via Fold3.com. 13 Navy Department Library, http://history.navy.mil/faqs/faq104-1.htm, accessed October 26, 2013. 14 http://navsource.org/archives/10/15/150633.htm, accessed November 8, 2013. 15 LCI Flotilla 21 War Diary, August 31, 1945, accessed via Fold3.com. 18 “Six Ohioans Add Punch to Rebel Cage Squad,” Cleveland Plain Dealer, October 28, 1946. 19 Alex Zirin, “Baumholtz Nets 25 as Rebels Win,” Cleveland Plain Dealer, November 4, 1946. 23 Jack Ledden, “$6,000 Holiday From Basketball for Frankie,” The Sporting News, February 4, 1948. 25 “Larry Jansen Pitch Puts Baumholtz on Sidelines,” The Sporting News, July 28, 1948. 27 John B. Old, “Biff-Bang Baumholtz Gets Okay from L.A.,” The Sporting News, May 31, 1950. 28 “Baumholtz’ Hitting Skein Ends at 33 Games in Row,” The Sporting News, June 7, 1950. 29 Ed Burns, “Rush Uncorks Victory, Frisch Smiles – Once,” The Sporting News, June 13, 1951. 31 Edgar Munzel, “Baumholtz Injury Fails to Trip Cubs,” The Sporting News, June 18, 1952. 33 Roger Birtwell, “Spahn Guarded by Chicago Police Following Threat,” The Sporting News, July 23, 1952. 34 “Musial Now Pitching – With Bat Rival Up,” The Sporting News, October 8, 1952. 35 Richard Dozer, “Sox Remember Baumholtz and His Bat,” Chicago Tribune, May 10, 1969. 36 Bob Logan, “Baumholtz Covered a Lot of Ground,” Chicago Tribune, July 7, 1986. 37 L. Robert Davids, “New Records for Pinch Hitters,” Baseball Research Journal, 1977. 40 “Grocer Group Elects Baumholtz,” Cleveland Plain Dealer, December 24, 1969. 41 “Baumholtz Joins Marquardt Bros.,” Cleveland Plain Dealer, June 10, 1970. 42 “Baumholtz, only Bobcat athlete with retired number, dies at 78,” Ohio University Today, Spring 1998. 43 Alana Baranick, “Frank C. Baumholtz, Played in National League,” Cleveland Plain Dealer, December 24, 1997.